Esther Allen Howland, born in 1828 at 16 Summer Street in Worcester, Massachusetts, was a pioneer in the American valentine manufacturing industry. It was after her graduation from Mount Holyoke College, in 1847, that she received her first English valentine. Fascinated with the idea of making similar valentines, she imported the necessary paper lace and floral decorations from England. She began taking orders for valentines, and was surprised to discover a demand for more than she could make by herself. She then recruited friends to assist her, and issued her first advertisement in a Worcester paper, The Daily Spy , on Feb. 5, 1850. The assembly line operation that began in her home eventually led to a thriving business grossing $100,000 annually. 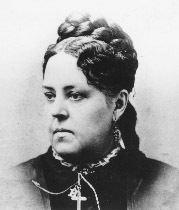 She retired in 1881, selling her business to the George C. Whitney Company. 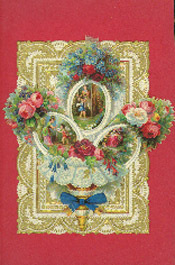 The golden age for artistic, sentimental valentines was the period from 1840-1860. 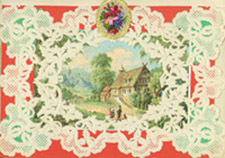 The advent of embossed, and then perforated lace paper for making valentines in England was enthusiastically acclaimed, and many were imported to America. The earliest paper lace developed in England was copied from handmade "real" lace, at first embossed by hand, later pressed by machinery. It was many years before such papers were produced in America, so that when Esther Howland began creating her valentines, it was still from lace-edged blanks purchased from England. 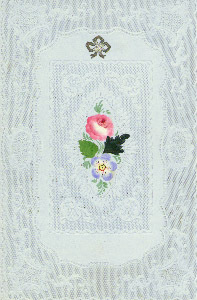 Esther Howland is credited with several innovations in valentine design. One was the small brightly colored wafer of paper placed to give contrast under the white paper lace; another was the built-up shadow box that became popular in the latter part of her career.